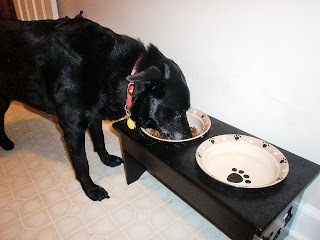 No two pets are alike, and neither are their nutritional needs. 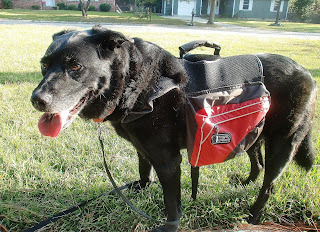 What works wonderfully for your lab mixes may not be the perfect choice for mine. Sadie has a rather sensitive tummy and Bailey just slowly works her way through whatever you put in front of her. They may look similar, but their appetites are completely different. That's why there are so many different kinds of pet food on the market. Depending on your cat's weight, your dog's breed and your bird's age, there are specific foods for specific needs. Within those individual categories there are still more choices - active formula, high fiber, high protein...it can really make your head spin. So what do you need to consider to make the best food choice for your own pet? 1. Stage of life. Puppies need different nutrients than an older dog. Senior cats don't need the same food as kittens. Read the packaging to find the recommended ages for each type of food. Many financial goals would be possible in our lives if we didn't eat, drive or pay rent. We'd have all sorts of money left over each month if we chose not to pay the utility bill or we never talked on the phone. As completely unrealistic as those scenarios are, a little planning can go a long way. In the professional world, short-term is defined as goals you can accomplish within a year. Anything longer than that takes more planning and effort. Generally we're thinking ahead to some special purchase or event. In just 12 months, with self-control and forward-thinking, there is so much we could accomplish with our budgeting. There are many financial situations that can be planned for in the short-term. You may be trying to cut household spending by a certain amount each month. Maybe the family wants to buy a boat or a camper. Or maybe you just want to get out of debt and live in the clear. All of these are attainable within that year if you set some reasonable goals. 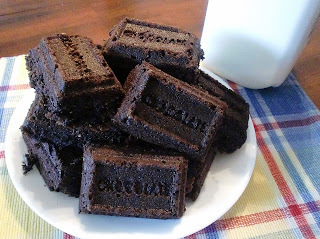 While eating chocolate around our house isn't anything out of the ordinary, this holiday gives a chance to celebrate one of our favorite treats. Here are some great ideas of how to spread the fun and festivities out - all day long! 1. Breakfast - Have some of your favorite chocolaty breakfast cereal or some chocolate chip pancakes. 2. Treat - Make a little gift bag of chocolates and hide it where you husband and children will find it. 3. Share - Take a variety bag of miniatures to work or school with you to pass around. 4. Lunch - Have a glass of chocolate milk with your sandwich! 6. Special - Enjoy some chocolate covered cherries or strawberries. 7. Love - Use tiny chocolates to make the outline of a heart on your husband's dinner plate. 8. Dinner - Chocolate and cocoa make great sauces and rubs for many different meats. 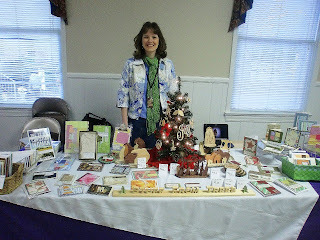 Saturday was the Fall Arts and Crafts Show at one of our local Christian schools. The entire day was an absolute joy from beginning to end, as you can see by the smile on my face! Danny and I had been working for weeks to put together what we thought was enough product to fill a table. I hadn't been in a craft show since junior high, and I really don't remember much about that one. I had taken everything from my etsy shop, Danny had made several pieces in his wood shop and I took along my book. It was such a pleasure to have sweet, wonderful women at the tables on either side of me. It made for sparkling conversation, a couple of sales and a comfortable day. There was such a wide variety of handmade items inside and outside, so there was much to wander around and look through. While watching baseball on television recently, I noticed a man waving a gigantic state flag. It was very difficult not to notice him, as he was sitting directly behind the right batter's box. Every time the camera angle changed to show the hitter, this man would stand up and wildly wave his huge flag. Did I mention it was enormous? Then my focus shifted. There was a young boy sitting behind the flag waver. He had to shift in his seat over and over again just to see the game around the flag bearer. You could clearly see the frustration in this little boy's face - he wanted to watch baseball. The man in front of him had an ulterior motive. You can probably tell by many of my posts here that I hate clutter. Messiness makes me anxious and scattered. It's difficult for me to accomplish anything during the day when I'm surrounded by disorganization. It's always been my personal philosophy to maintain whatever order I could. I read a quote over the weekend that gave me a different insight on clutter. The woman wrote that a cluttered home showed that someone lived there. It was an accumulation of life that caused one to think that home doesn't have to be perfect, just warm and comfortable. Order works for me. It may be different for you. I enjoy a home that is clean, neat and tidy. You may enjoy a home that is clean, rumpled and a little disorganized. I function best when the piles are gone and the world is in place. You may function best just knowing that what you need is in that pile over there. When are you the most happy in your home? Is it when your ducks are all in a row and quacking happily? ...well, through our neighborhood anyway. 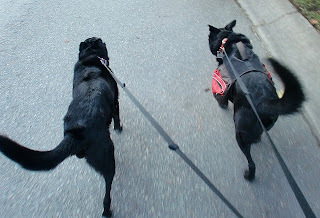 When your dogs are almost half your size and you walk them together, it quickly turns from a stroll to a trot. We've had a lot of trouble with the girls pulling terribly while on the leash over the years. They are very competitive with each other so they hurry to get "there" first. Their walk time is the best part of their day so they pull to see how much they can see, smell and hear before we go back inside. With my fibromyalgia walking the girls can be pretty painful. Imagine already hurting to your bones and then having a 60-pound black lab decide to pull your shoulder out of its socket. Not how I want to spend my morning, that's for sure. Last week I challenged you to pull out some old recipes, so I decided to take the challenge myself. I love this chicken stir fry, even though I can't remember for the life of me where it came from. It is both easy and incredibly sweet, so I hope you enjoy it as much as we did! 1. Cut 1 pound boneless, skinless chicken into bite-sized pieces. Toss with 2 tbsp corn starch to coat. 2. Heat a little oil in a skillet, then stir fry chicken until cooked through. 3. In the meantime, heat a 16-ounce bag of microwa-in-bag broccoli. 4. To skillet, add 1/4 cup sweet and sour sauce, 1/4 cup water, 1/4 cup honey, 1 tsp orange zest and crushed red pepper to taste. Bring to a boil. 5. 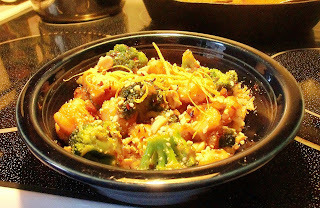 Stir in broccoli and 1/4 cup chopped cashews, almonds or peanuts. The everyday is a yawner. Let's take the changing season to heart and try something a little different. I made this card in the usual way with one slight modification. Instead of opening from the side or the bottom, this card opens in two panels, slightly off-center. It's a beautiful look and one that really draws attention to your focal point. To start, measure your envelope. Cut a piece of card stock to the proper height and twice the width. Fold this new strip into thirds, making the meeting point a little to the right of center. Crease the edges well with a bone folder or another straight edge. Cover each of the two panels with their own pieces of decorator paper. 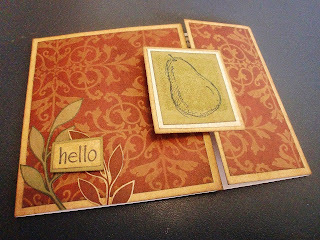 Layering is crucial to make an interesting, finished card. Place the focal point accent overlapping the gap in the two flaps. Adhere the right side only so it will open up properly. There once was a man and woman, husband and wife. They lived an average, ordinary, everyday life. They had an average, ordinary, everyday marriage. After many years they had settled into a comfortable, normal routine. One Monday night during supper, the woman noticed that her husband seemed a little down. That had been happening more frequently lately, and she was becoming concerned. When she asked him if everything was alright, the husband got up from the dinner table and went into the kitchen. After rummaging around in the cabinets for a minute, he came back holding a glass jar. He set it on the table next to his wife's plate. "This is how I feel," he said, pointing at the empty jar. "I used to be filled, even overflowing. But after a while we settled into life and now I feel empty like this jar." I found myself doing simple Internet searches this week...literally. It's easy to remember a time when life was simple - before running a business, promoting a book, keeping a home and being a church member. There was a time when I didn't think as much, do as much or care as much. That's when I was a child. As a grown woman, wife, daughter, niece, crafter, piano teacher, Sunday School teacher...the list goes on and on...I am called by God to care for His people and the things He has blessed me with here on earth. That takes time. That takes energy. That takes a lot out of a woman! There are so many cliches about time, but one in particular seems to fit these days. Do you remember when you were little and time seemed to stand still. You would stare at the clock waiting for the final school bell to ring. You would fidget in the car just waiting to get to your destination. And you would probably count the ceiling tiles during the Sunday morning church service. No matter where you were you were also wishing time would go faster so you could move on to something else. But now that we're grown, time flies. There are more things to try and accomplish than ever before. Our responsibilities keep us busy and then we squeeze in some fun stuff on top of them. We live out of our cars and grab something to eat whenever we can. There's always one more thing that could get crammed into the day, and so we do. Our Bailey-dog is the most submissive puppy ever. She's a little protective of us around strange sounds and people she doesn't know, but she's happy to flop on her back and let you take charge. In exchange for belly rubs, which is fine with me. 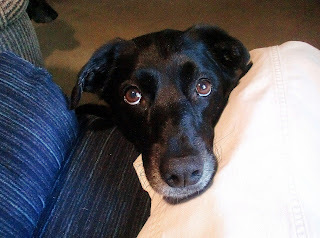 Now Sadie on the other hand...she's a pushy, pushy girl. She gets very jealous and very excited about whatever is happening around her. She's not aggresive - she's just pushy. If Bailey's getting a treat, then she'll push her way in for one, too. If it's time to go for a walk, she has to be the first one to the door. If there's company, she wants full attention regardless of who they're actually here to see. We've really had to put the brakes on this kind of behavior. Pushy puppies are cute and you giggle over their antics, but a pushy 60-pound black lab isn't so cute anymore. Pushing turns into dominating and we refuse to let it turn into that. Did you know that creating some financial habits can actually help you discover happiness? When women feel like they're in control of their finances, regardless of the amount in the bank, it takes away that helpless feeling. So using some basic Biblical principles we can gain control of our money, create some new habits and find that financial happiness that God intended. Give your tithe faithfully. The first and most important step to financial happiness is to give one tenth of all you make to the local church. What? Give money away to be happy? Yes, because it is what the Lord commanded. No matter how much or how little you make, God will provide all you need when you give back that portion of what He's allowed you to have. Fall is officially here, which means I'm more than excited to pull my slow cooker out more often. And that means warm, tasty meals without a lot of work...my favorite combination! 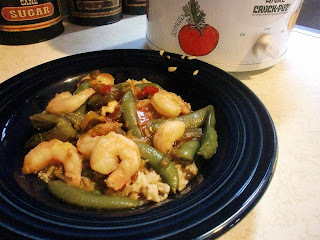 So this week I blew the dust off my Crock Pot cookbook and found a fabulous new sweet and sour shrimp recipe to try. This one also takes only 3 hours, so time is an added bonus. I've varied a few ingredients to my personal taste, and I imagine you'll do the same. 1. Place first nine ingredients in slow cooker. Cook on low 3-4 hours, on high 2-3 hours. Vegetables will be tender. Stir. 2. Add snow peas and cook on high an additional 15 minutes. As we head into the holiday season, etsy has asked its shop owners to write a mission statement - a single sentence that explains who we are, what we do and why we do it. This is ours. Stuff From Trees helps Christians share God's Word by creating one-of-a-kind greeting cards and gifts of the highest quality to bring glory and honor to our Lord and Savior. Our goal for our shop is truly this simple. I craft because I want to create something that reflects my devotion to God. It's not to promote myself, but lift up the name of Jesus. It's not simply to make a profit, but to spread the Scripture as far as I can. With the Lord's help this is becoming a reality and it is a precious time for me. There's a line in Meredith Wilson's "The Music Man" that says, The idle brain is the devil's playground...Oh we got trouble! We fight with the mind every day, whether we're working, relaxing, in fellowship or laying down to sleep at night. Our brains work overtime on whatever settles into them, and that can be dangerous. How often have you worried over something that never happened? Or prepared a conversation, repeating it again and again? Have you speculated about someone's actions instead of asking them about it? Do you ever picture the worst-case scenario so you're ready if it happens? Maybe you've let your mind consider all the possibilities rather than take God at His Word? These are all ways that we allow evil to creep into our minds. Without giving him too much credit, the devil can whisper lies in your ear that sink into your brain. Then you think on it, work it over, chew on it for a while and then turn it to worry, hate and more lies. There's nothing worse than working diligently to prepare a meal in an unsanitary kitchen. Not to mention the health risks and potential hazards a contaminated workspace can create. A little elbow grease and the sacrifice of some time can eliminate the chance of food poisoning and a trip to the doctor. Start at the top and work your way down. Clean out the light fixtures to be rid of any bug parts and dust. Wipe off fan blades and any other flat surfaces (like the tops of cabinets and the refrigerator) where the nasty stuff collects. Getting rid of this now will keep surfaces you've already cleaned from getting showered on later. Empty the cabinets and clean your dishes in hot, soapy water. Chances are some of them haven't been used in a while and are covered in dust. If you own a pet there is probably fur and dander on the shelves, so wipe them off as well. Thoroughly clean the outsides of the cabinet doors and disinfect the handles. Reorganize as necessary and restock. As long as we live on this earth, we are flesh. We do fleshly things and think fleshly thoughts. This includes the decisions we make about spending our time. The choices will come in a heartbeat, over and over again, and the two results are worlds apart. If I'm spending my time this week doing what God has called me to do, then I won't be spending my time doing the things that are against His will. The things that grow me in my walk with the Lord will occupy my time instead of those that satisfy the flesh. This sounds like a terribly easy concept, but how often do we actually follow through? This is my view every morning on our walk. It is one of the best times of day because we can start the day off right. We're getting sun, fresh air, exercise and bonding time all in one. You can't say that about a gym membership! The American College of Sports Medicine recently reported that in a 15-minute dog walk you can burn over 60 calories, plus lower your cholesterol and blood pressure. And all while breathing some fresh air! Whether you create an exercise program around walking your dog or simply want to enjoy some time together, a trip around the block has many benefits for both of you. * It's a chance to meet people in your neighborhood. * You can improve several health issues including cardio, circulation, blood pressure and joint problems. * You'll develop a closer bond with your pet. * Setting aside time every day will help you plan, schedule and build a life routine. * You can get fabulous exercise without spending money on a gym membership. It wasn't until I opened my etsy shop that I heard the word "upcycle." The word literally means turning something that would normally be considered useless into something useful and beautiful. Think about the amount of money we could save over a month or even a year if we looked at things we might usually throw out as the supplies for upcycling something new and wonderful. For example, without even realizing it I took an old beat-up cake pan and turned it into my year-round centerpiece. I wasn't even familiar with upcycling, but the pan was something I had planned to donate to the thrift shop. Instead, it has become one of my favorite pieces. As the temperature cools off, I'm looking for simple, warm meals that will get us through the day. 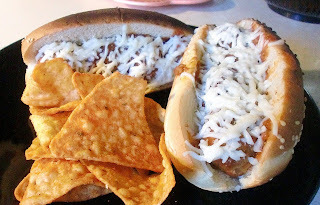 I dug out this meatball sandwich recipe that I put away in the spring and pull out in the fall. It's prefect for chilly days because it will warm you up quickly - because it cooks quickly! 2. Heat soup in a saucepan with the spices. I don't do measurements, but go by look and taste. Use the amounts you'd like. 3. Add the meatballs and cook until heated through. Don't let it get too hot, though, or the soup will curdle and get sticky...very nasty stuff. 4. Divide the meatballs among the rolls and top with the extra sauce and cheese. I used soft hoagie rolls with sesame seeds this time. Set them under the broiler for 1-2 minutes, just until the cheese is all melted and gooey. We live in an age where creative ideas are at our fingertips - literally. We can flip through magazines and mark things we'd like to try. We can type a few words into a search engine and be given thousands of pages to browse. We can even channel surf for a few minutes and discover entire stations devoted to crafts and decorating. I don't know if you're like me, but after all that input I get mental and visual overload. The ideas and enthusiasm to try something new start to trip over each other in my head and that leads to...that overwhelming shutdown. There's a broken coffee cup on the kitchen counter right now. It's poor little handle is in two pieces next to it. Later today it will get some glue and be right as rain, but for the moment it sits there empty and pretty useless. I've felt like that cup a lot lately. It seems like I've been so full of other things that God hasn't been able to fill me with His goodness. That's what I've been lacking - not joy or happiness or peace, but my empty vessel for Him to fill. Sometimes we have to be broken in order to see how badly we need the Lord to put the pieces back together. It's painful and it's uncomfortable, but it's necessary if we're going to grow. 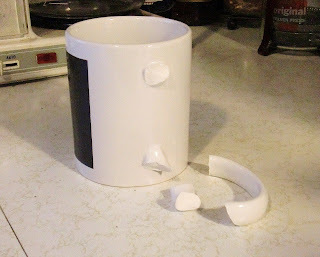 There's nothing that coffee cup can do to reattach it's own handle. It has to wait for me to take care of it. And I will...just like God will take care of me. Every home is different, but in each one there is a place where the work gets done. You may pay bills at the dining room table. You might do all of your banking at the computer desk. There is business to attend to and space is usually in short supply. When I reorganized my craft room, I sacrificed our broken-down computer desk for more floor space. It has been a wonderful blessing for my card-making business, but it left our bill paying center without a home. We needed a place for the everyday office supplies that would be safe, hidden from sight and out of the way. And that's where one of my favorite pieces of furniture saved the day. 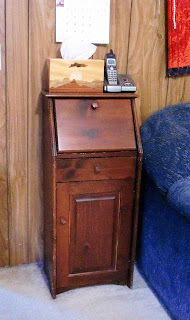 I adore this telephone stand, mostly because it came from my aunt and uncle's home. The other part is that it is the perfect size and layout for the jobs we need it to perform. Plus it's the exact width of the tissue box cover my wonderful husband so thoughtfully and skillfully made for me! Isn't it beautiful? There is a spot in Columbia, South Carolina, where Interstates 20 and 77 cross. Three lanes of traffic going north go three separate directions, and if you're not in the correct lane, things can be a little messy. Consideration for those around this area seems to take a back seat to doing what's necessary at the moment. Drivers tend to make last-minute decisions about which highway they need to be on and which lane takes them that direction. Turn signals aren't necessary for lane changes because they know where they're headed, right? It's frustrating to be in the right lane, traveling the right speed and going in the direction I need to be going while everyone else is hurrying and darting and breaking numerous traffic laws. The ASPCA estimates that around 10 million animals are dropped off at shelters across the country each year. They're just waiting for those forever homes with people who want to love and cherish them. October is National Adopt A Shelter Dog Month, and if you're looking for a special friend you'll truly be blessed by a trip to your local shelter. Both of our girls were shelter dogs, and I can remember the days that I got each of them like they were yesterday. 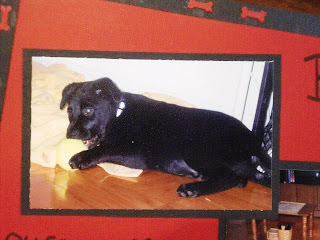 Bailey was the first dog I had ever owned, and she came from the Fort Knox shelter. She was one of eight puppies and there were three left when I found her. She is truly the four-legged love of my life and I treasure every moment we enjoy together. Then a few months later came her little sister, Sadie. She was a parvo puppy and there was no way I could leave her in that shelter in her condition. After a few days at the vet's office on an IV she was good to go and she's never looked back. Fall is my absolutely favorite time of the year. I love the colors, the smells and the changes God makes in nature. It's such a beautiful season and I could handle it 24/7, 365! And this is the time to be cleaning, redecorating and changing your home into an autumn haven. I love replacing all the bright summer colors with the muted, deep shades of fall. You don't need sea shells anymore, so the leaves and wreaths come out. It's just an exciting time of year. If you're a nester like I am, you want your home to be comfortable and cozy, but you also want to respect your budget and the money God has given your family. There are many, many ways to do both and one of the best is checking out the local dollar store. 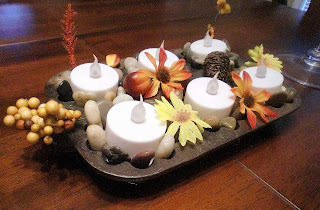 You can easily decorate, entertain and craft with the fall theme without breaking the bank just by comparing prices at these discount places. For example, here's what I found at out local dollar store this week.